When Spencer MacCallum walked into Bob’s Swap Shop in Deming, New Mexico in 1976, he had no idea that his life and thousands of lives in a a dusty Mexican town were about to change. As a teenager in Mata Ortiz in the 1960s, Juan Quezada would find pottery created by the Paquimé Indians while searching for firewood in the mountains that enveloped the small village. 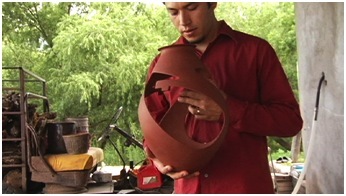 These pots (up to 800 years old) and their geometric patterns fascinated young Juan and he began to experiment with local clay, pigments and firing techniques. Without any sort of training, Quezada relied on a painstaking trial-and-error method. Quezada’s pots and all Mata Ortiz pottery were and continue to be completely hand-made and fired without the use of a kiln. 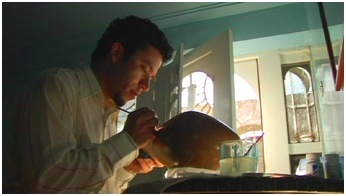 After several years, Quezada had mastered the craft and local traders purchased enough of his pots to encourage Quezada to pursue pottery full time. Later, he taught family members and neighbors the art form. From these humble beginnings, the word spread about the amazing art coming out of a small village in the Chihuahua Desert. In 1976, anthropologist Spencer MacCallum found three of Quezada’s pots in a second-hand store in Deming, New Mexico. The store’s owner told MacCallum that some poor people had traded them for some clothing. Fascinated by Quezada’s skill and unique talent, MacCallum decided to track down the artist. Carrying pictures of the pots and his sense of adventure, MacCallum, on the advice of the store owner, headed down to Mexico. He finally located Quezada in Mata Ortiz and convinced him that MacCallum could sell his wares in the United States. What began as a hobby for Quezada has turned into a phenomenon that is recognized worldwide. Today, ceramic pottery - or ollas in Spanish - from Mata Ortiz can sell in galleries for up to $10,000. One of Quezada’s pots resides in the Vatican and, in 1999, Mexican President Ernesto Zedillo honored him with the Premio Nacional de los Artes, the country’s most prestigious award for a living Mexican artist. 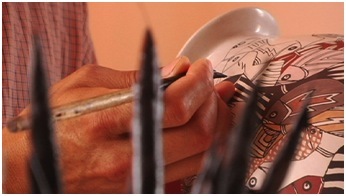 In a village of a few thousand, Mata Ortiz now boasts several hundred potters and numerous diverse styles. Young children are taught the process by their parents to continue this still-new tradition. 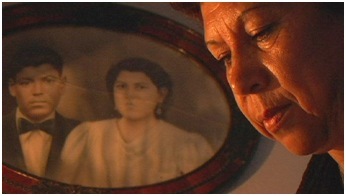 Prior to Quezada, Mata Ortiz residents suffered many economic hardships, with most living in poverty. With their newfound success derived from clay, pigments, hard work and artistic inspiration, more inhabitants of Mata Ortiz are now able to provide their families with medical care, an education and a future. The pottery itself is stunning. 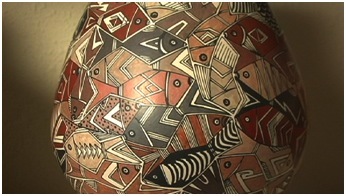 Made from locally dug clay and pigments, many incorporate long flowing lines (some made with a brush of a single human hair) with geometric patterns of rich blacks, reds and oranges. Others feature animals or ancient symbols scratched into the surface of the pot. Still others burnish their pots to a spectacular mirror black finish. These thin-walled pieces can be incredibly balanced and light. The top artists continue to evolve their personal style and find new ways to express themselves creatively. Artist Diego Valles was born in the even smaller Santa Rosa, a few miles down a dusty, unpaved road from Mata Ortiz. Extraordinarily smart and creative, Valles earned an engineering scholarship and appeared to be on track for an office job. In an unusual twist, he decided to return to the village to work as an artist. His work is among the most inventive in the village. With a wife and new baby, his struggle to become an established potter will be profiled. Valles recently won the Premio Nacional de la Juventud (National Youth Prize), the top arts prize the Mexican government gives to citizen under 30. The Frank Lloyd Wright Foundation has also awarded Valles an artist-in-residence at Taliesin West in Scottsdale, Arizona (the first given to a ceramics artist).